Drew Desharnais is a 41 year-young, self-taught photographer from Okanagan Falls, BC. Four years ago Drew went on a camping trip to the Kootenay region with some friends who were photographers that were into capturing long exposure images of the night sky. Upon seeing the resulting images that his friends had captured, Drew knew he had to try his hand at this Night Photography thing. His friends encouraged him to pick up a used entry level DSLR camera and he started his journey into photography. He was instantly hooked! 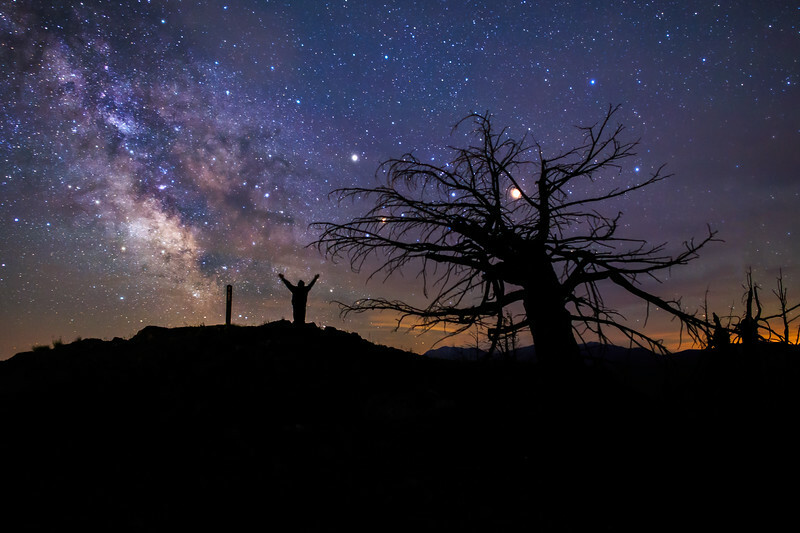 Drew’s journey into photography started mainly with taking long exposure images of the night sky, namely our Milky Way galaxy. This journey quickly evolved into an obsession with, and passion for, landscape and nature photography as a whole. This obsession and passion continues to this day, but Drew also dabbles in various other genres of photography such as Astrophotography, Time-Lapse photography, Architectural photography, light Painting photography, commercial/stock photography, still life photography, Abstract photography, and Portrait Photography. Drew focuses much of his time and effort exploring and scouting the vast and beautiful natural areas that the South Okanagan Valley provides. The South Okanagan is home to countless Mountains, lakes, rivers and streams, marshes, and wildlife species, which provide endless photographic subjects. In the past 4 years Drew has devoted countless hours and great expense to exploring and photographing the amazing views and landscapes that the Okanagan region has to offer, not to mention the flora and Fauna that inhabit these beautiful vistas. Prior to becoming a photographer Drew had many different occupations. He was a student at UNBC where he acquired his Bsc with a Major in Geography. He worked in the retail world for years while attending University. He built modular houses for a few years after university. He was an Oilfield Paramedic for a few years, obtaining his Level 3 First aid and an EMR license. When he discovered photography though, he knew he had finally found his calling and finally a sense of purpose and he never looked back! Drew has gained extensive experience in the world of Landscape and nature photography in the past 4 years, mainly by getting out and shooting every day regardless of lighting and weather conditions. Although mainly self-taught, he has had some guidance from some other local pros such as Stephen Hancock of Unique Captures, Caillum Smith of Preserved Light Photography and Linda Quon of Foilans Photography. These fine people were always happy to point Drew in the right direction when he had questions. They are now colleagues and friends! Drew has also looked to other photographers around the world for inspiration! He is heavily influenced by the work of the Great Ansel Adams (The father of landscape photography), Michael Shainblum (Milky Way Guru) as well as some great Canadian photographers such as Paul Zizka, Callum Snape, John Marriott and Dave Brosha. One of the main reasons Drew is so passionate about landscape and nature photography is that it provides an intimate connection with the environment, not to mention an escape from the day-to-day stresses and pressures of life. Being an introvert by nature also contributes to his desire to escape and the quest for peace and balance (Which nature provides in droves). In addition, all his life, he has been extremely interested in Earth sciences such a Geography, geomorphology, glaciology, biology, limnology and meteorology. The forces and processes that shape our planet, weather, and regional landscapes have always fascinated him. This fascination with weather and landscape ties in intimately with his passion for landscape and nature photography. With the support and encouragement of his family and friends, Drew continues his daily explorations of the South Okanagan and is always on the lookout for that next great shot! In addition He recently partnered with the Felts Photography and Printing Services and has a large permanent display of his work in their gallery at 221 main St Penticton BC. In addition he has a small display at Oliver Twist Winery in Oliver BC. Also, he has a website (www.drewdphotography.com) and a social media presence on Facebook (www.facebook.com/drewdesharnaisphotography), instagram (@drewdphotos) and twitter (@drewakalunchbox). He also teaches the skills he has learned to others via private and group workshops. The Future looks bright! Drew is heading to Portugal for a month this April to continue his photographic journey along the Limestone cliffs of the Portugal coast. Drew looks forward to continuing his photography journey and looks forward to the constant learning opportunity that photography provides. “Never stop learning” is one of his Mantras! In the future Drew will be expanding his workshop opportunities, and will be focusing on increasing his viewership and sales on his social media platforms and website. He is also starting to delve into the world of Stock photography sales. In addition he will be learning custom printing and framing skills so that he can control the entire creative process from shooting to printing to framing. Finally, he will be focusing more on submitting his work to national magazines/publishers such as Canadian Geographic, National Geographic and Canadian Outdoor Photographer etc.. Overall, He looks forward to constant exploration and to creating more and more unique and dynamic images that he can share with his community and the world!